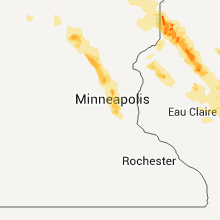 The Motley, MN area has had 4 reports of on-the-ground hail by trained spotters, and has been under severe weather warnings 21 times during the past 12 months. 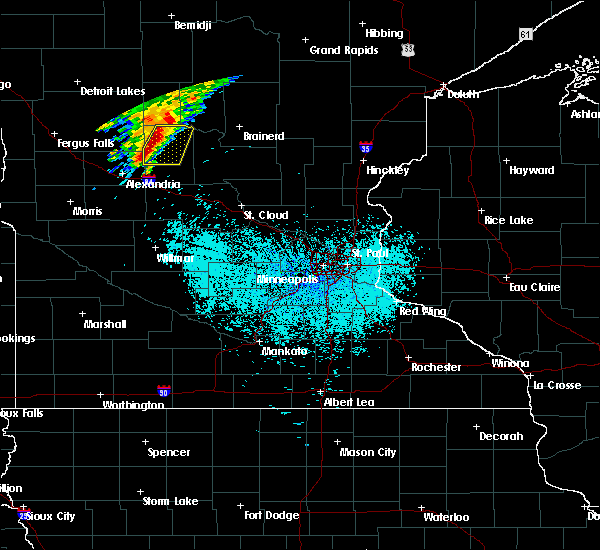 Doppler radar has detected hail at or near Motley, MN on 30 occasions, including 4 occasions during the past year. 9/2/2018 6:20 AM CDT At 619 am cdt, severe thunderstorms were located along a line extending from 7 miles east of huntersville, to 8 miles east of leader, moving northeast at 40 mph (radar indicated). Hazards include 60 mph wind gusts and half dollar size hail. Hail damage to vehicles is expected. expect wind damage to roofs, siding, and trees. Locations impacted include, walker, breezy point, pequot lakes, crosslake, nisswa, pine river, pillager, fifty lakes, hackensack, backus, poplar, leader, gull lake, woman lake, leech lake, sylvan, lake shore, east gull lake, oshawa, and jenkins. 8/31/2018 6:09 PM CDT At 609 pm cdt, severe thunderstorms were located along a line extending from 7 miles west of backus, to near leader, moving east at 40 mph (radar indicated). Hazards include 60 mph wind gusts and half dollar size hail. Hail damage to vehicles is expected. Expect wind damage to roofs, siding, and trees. 7/12/2018 3:03 AM CDT At 303 am cdt, severe thunderstorms were located along a line extending from 6 miles southeast of tamarack, to near deerwood, to near pillager, moving southeast at 20 mph (radar indicated). Hazards include 60 mph wind gusts. Expect damage to roofs, siding, and trees. 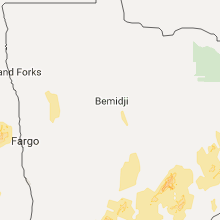 Locations impacted include, brainerd, mille lacs lake, big sandy lake, baxter, crosby, aitkin, nisswa, ironton, deerwood, pillager, mcgregor, malmo, cuyuna, garrison, kettle river, tamarack, fort ripley, upper south long lake, gull lake, and south long lake. 7/4/2018 7:41 AM CDT The severe thunderstorm warning for cass and crow wing counties will expire at 745 am cdt, the storms which prompted the warning have weakened below severe limits, and no longer pose an immediate threat to life or property. therefore, the warning will be allowed to expire. however gusty winds and heavy rain are still possible with these thunderstorms. 7/4/2018 7:25 AM CDT At 707 am cdt, severe thunderstorms were located along a line extending from leech lake, to 7 miles south of motley, moving east at 35 mph (radar indicated). Hazards include 60 mph wind gusts and quarter size hail. Hail damage to vehicles is expected. expect wind damage to roofs, siding, and trees. 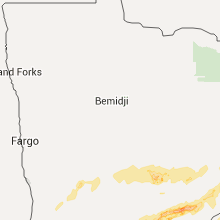 Locations impacted include, brainerd, walker, baxter, crosby, breezy point, pequot lakes, crosslake, nisswa, pine river, emily, ironton, deerwood, pillager, fifty lakes, remer, wabedo, cuyuna, hackensack, backus, and poplar. 7/4/2018 7:07 AM CDT At 707 am cdt, severe thunderstorms were located along a line extending from leech lake, to 7 miles south of motley, moving east at 35 mph (radar indicated). Hazards include 60 mph wind gusts and quarter size hail. Hail damage to vehicles is expected. expect wind damage to roofs, siding, and trees. 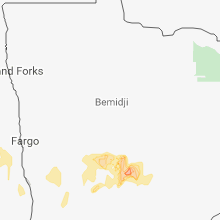 Locations impacted include, brainerd, walker, baxter, crosby, breezy point, pequot lakes, crosslake, nisswa, pine river, emily, ironton, deerwood, pillager, fifty lakes, remer, wabedo, cuyuna, hackensack, backus, and poplar. 7/4/2018 6:55 AM CDT At 655 am cdt, severe thunderstorms were located along a line extending from near walker, to 8 miles southwest of motley, moving east at 35 mph (radar indicated). Hazards include 60 mph wind gusts and quarter size hail. Hail damage to vehicles is expected. Expect wind damage to roofs, siding, and trees. 6/17/2018 12:38 PM CDT At 1238 pm cdt, severe thunderstorms were located along a line extending from near motley to 7 miles northwest of swanville, moving east at 30 mph (radar indicated). Hazards include 60 mph wind gusts and quarter size hail. Hail damage to vehicles is expected. expect wind damage to roofs, siding, and trees. 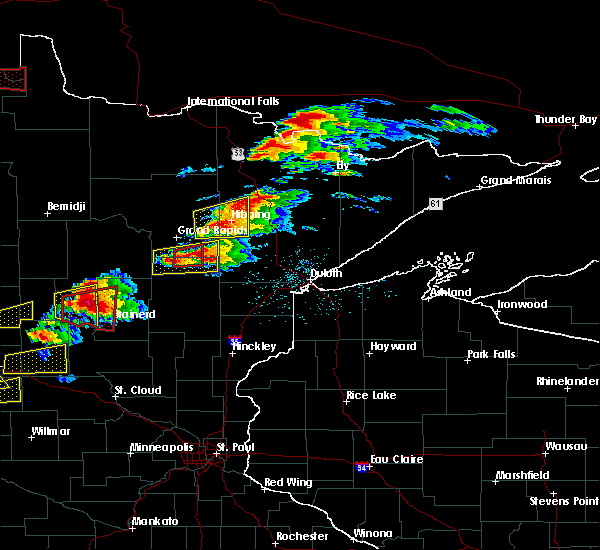 these severe storms will be near, flensburg around 1255 pm cdt. 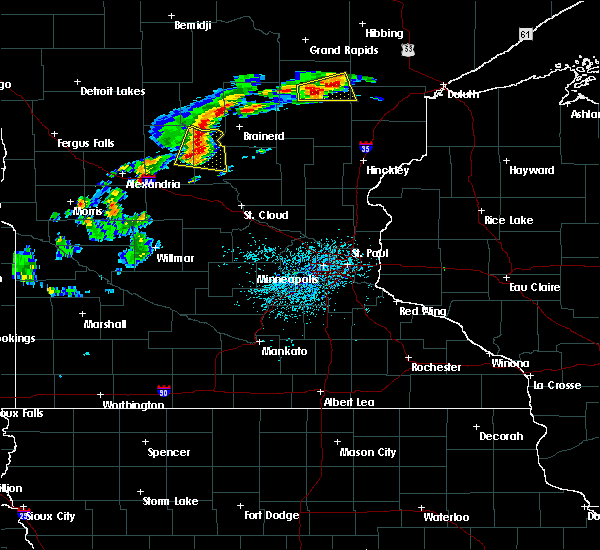 little falls and randall around 100 pm cdt. A tornado watch remains in effect until 900 pm cdt for central minnesota. 6/17/2018 12:22 PM CDT At 1222 pm cdt, a severe thunderstorm was located over long prairie, or 24 miles west of little falls, moving east at 35 mph (radar indicated). Hazards include 60 mph wind gusts and half dollar size hail. Hail damage to vehicles is expected. expect wind damage to roofs, siding, and trees. this severe thunderstorm will be near, randall around 1255 pm cdt. 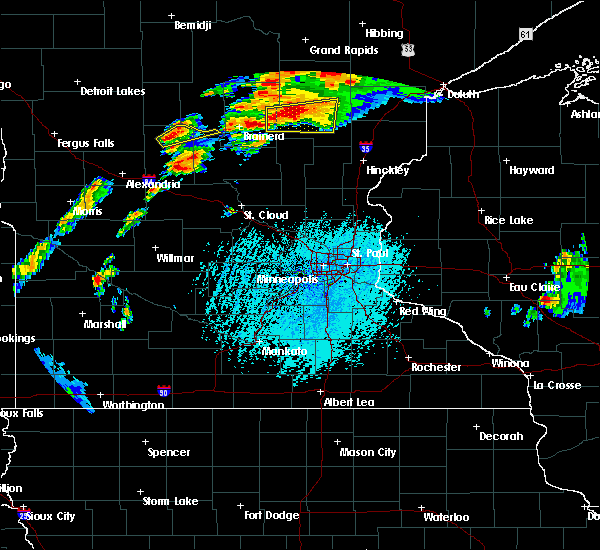 Little falls and camp ripley around 100 pm cdt. 6/16/2018 11:56 PM CDT The severe thunderstorm warning for eastern todd and northwestern morrison counties will expire at midnight cdt, the storm which prompted the warning has weakened below severe limits, and no longer poses an immediate threat to life or property. therefore, the warning will be allowed to expire. however gusty winds are still possible with this thunderstorm. 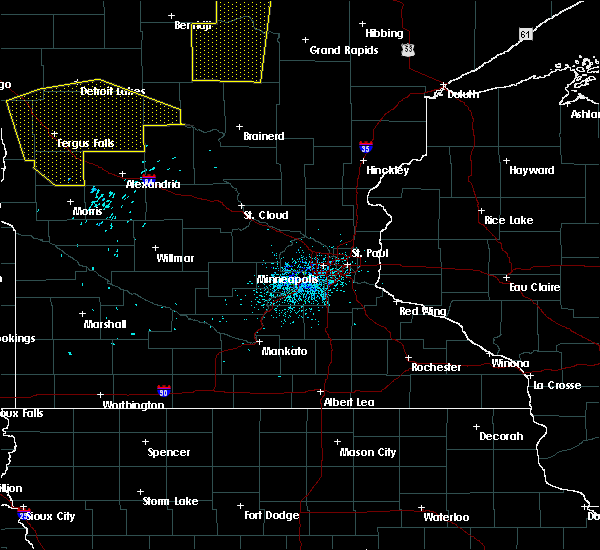 a severe thunderstorm watch remains in effect until 500 am cdt for central minnesota. 6/16/2018 11:49 PM CDT At 1149 pm cdt, a severe thunderstorm was located over randall, or 12 miles northwest of little falls, moving northeast at 40 mph (radar indicated). Hazards include 60 mph wind gusts. Expect damage to roofs, siding, and trees. Locations impacted include, little falls, long prairie, motley, randall, swanville, flensburg, camp ripley, cushing, burtrum, philbrook, camp ripley junction and crow wing state park. 6/6/2018 2:57 AM CDT The severe thunderstorm warning for douglas and todd counties will expire at 300 am cdt, the storms which prompted the warning have weakened below severe limits, and no longer pose an immediate threat to life or property. therefore the warning will be allowed to expire. however wind gusts to 45 mph are still possible with these thunderstorms. a severe thunderstorm watch remains in effect until 600 am cdt for central and west central minnesota. 6/6/2018 2:28 AM CDT At 228 am cdt, severe thunderstorms were located along a line extending from near bertha to near carlos to 6 miles southwest of hoffman, moving east at 45 mph (radar indicated). Hazards include 60 mph wind gusts. Expect damage to roofs, siding, and trees. 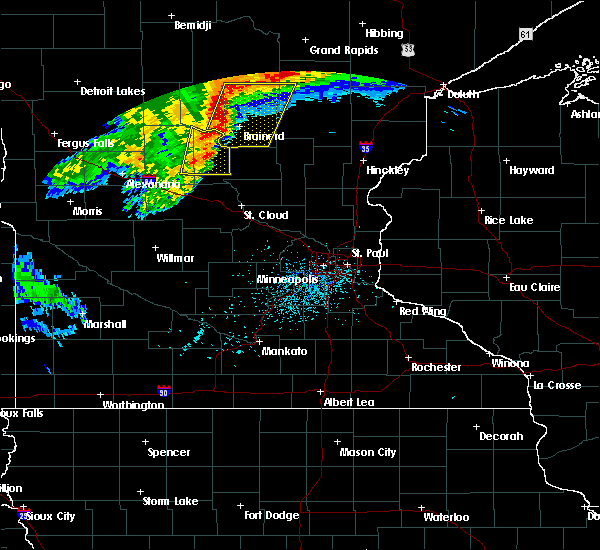 these severe storms will be near, carlos around 235 am cdt. 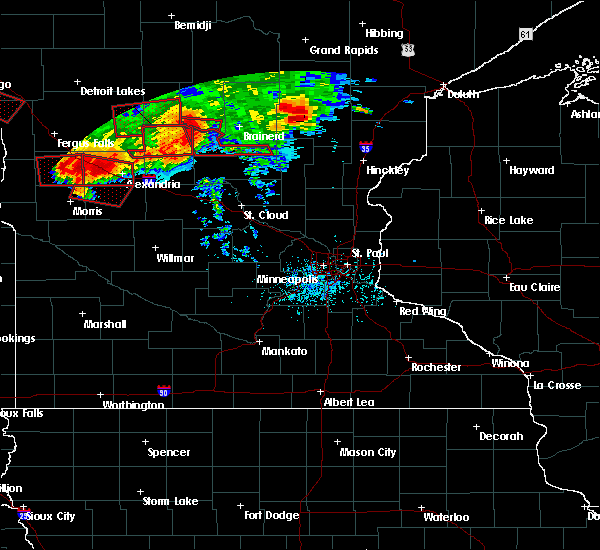 staples around 240 am cdt. 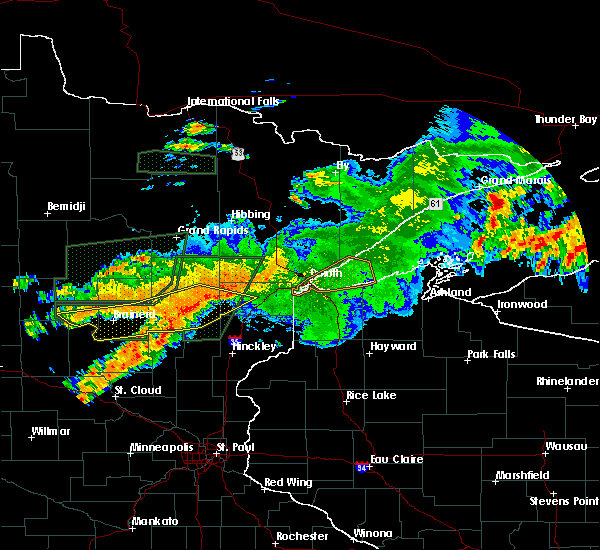 lake osakis around 250 am cdt. long prairie around 300 am cdt. Other locations impacted by these severe thunderstorms include nelson, garfield, melby, miltona, rose city, holmes city, clotho, philbrook and forada. 6/6/2018 2:09 AM CDT At 209 am cdt, severe thunderstorms were located along a line extending from near deer creek to near evansville to near herman, moving east at 45 mph (radar indicated). Hazards include 60 mph wind gusts. Expect damage to roofs, siding, and trees. severe thunderstorms will be near, hewitt around 220 am cdt. bertha around 225 am cdt. staples, carlos, and kensington around 235 am cdt. 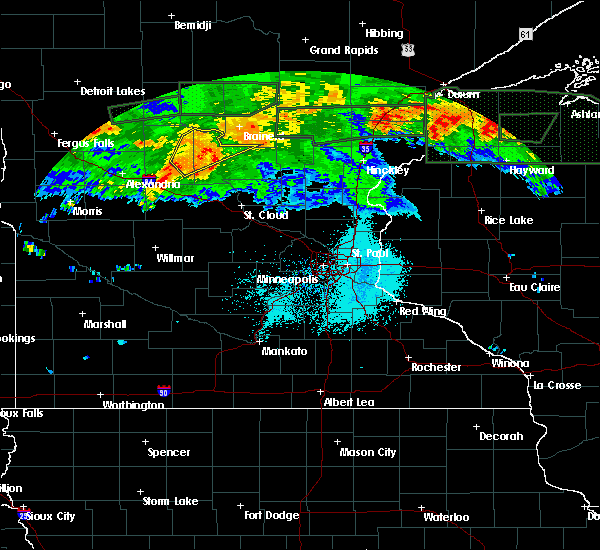 lake osakis around 245 am cdt. long prairie around 300 am cdt. other locations impacted by these severe thunderstorms include alexandria airport, nelson, garfield, melby, miltona, rose city, holmes city, clotho, philbrook and forada. this includes the following highways, interstate 94 in minnesota between mile markers 81 and 119. u. s. highway 10 in minnesota between mile markers 103 and 114, between mile markers 117 and 118, and between mile markers 123 and 125. u. s. Highway 71 between mile markers 185 and 219. 5/29/2018 4:05 PM CDT At 405 pm cdt, severe thunderstorms were located along a line extending from near poplar, to near leader, to near pillager, moving north at 35 mph (radar indicated). Hazards include 60 mph wind gusts and nickel size hail. Expect damage to roofs, siding, and trees. Locations impacted include, pine river, poplar, leader, oshawa, chickamaw beach, casino, and esterdy. 5/29/2018 3:41 PM CDT At 330 pm cdt, a severe thunderstorm was located near leader, or 28 miles west of brainerd, moving north at 35 mph. other strong to severe storms were located over todd county, moving north at around 40 mph (radar indicated). Hazards include 70 mph wind gusts and quarter size hail. Hail damage to vehicles is expected. expect considerable tree damage. Wind damage is also likely to mobile homes, roofs, and outbuildings. 5/29/2018 3:30 PM CDT At 330 pm cdt, a severe thunderstorm was located near leader, or 28 miles west of brainerd, moving north at 35 mph. other strong to severe storms were located over todd county, moving north at around 40 mph (radar indicated). Hazards include 70 mph wind gusts and quarter size hail. Hail damage to vehicles is expected. expect considerable tree damage. Wind damage is also likely to mobile homes, roofs, and outbuildings. 9/22/2017 4:41 AM CDT At 441 am cdt, severe thunderstorms were located along a line extending from near staples airport, to near motley, to near pillager, moving northeast at 40 mph (radar indicated). Hazards include 60 mph wind gusts and half dollar size hail. Hail damage to vehicles is expected. expect wind damage to roofs, siding, and trees. Locations impacted include, pillager, leader, gull lake, east gull lake, and casino. 9/22/2017 4:39 AM CDT At 439 am cdt, a severe thunderstorm was located near lennox, or 14 miles southwest of brainerd, moving northeast at 40 mph (radar indicated). Hazards include 60 mph wind gusts and quarter size hail. Hail damage to vehicles is expected. expect wind damage to roofs, siding, and trees. Locations impacted include, motley, philbrook and crow wing state park. 9/22/2017 4:35 AM CDT At 435 am cdt, a severe thunderstorm was located over motley, or 22 miles west of brainerd, moving northeast at 45 mph (radar indicated). Hazards include 60 mph wind gusts and half dollar size hail. Hail damage to vehicles is expected. expect wind damage to roofs, siding, and trees. Locations impacted include, pillager, leader, gull lake, east gull lake, and casino. 9/22/2017 4:31 AM CDT At 431 am cdt, a severe thunderstorm was located over staples, or 30 miles west of brainerd, moving northeast at 35 mph (radar indicated). Hazards include 60 mph wind gusts and quarter size hail. Hail damage to vehicles is expected. expect wind damage to roofs, siding, and trees. this severe storm will be near, staples around 435 am cdt. Staples airport around 440 am cdt. 9/22/2017 4:28 AM CDT At 428 am cdt, a severe thunderstorm was located over cushing, or 15 miles northwest of little falls, moving northeast at 40 mph (radar indicated). Hazards include 60 mph wind gusts and quarter size hail. Hail damage to vehicles is expected. expect wind damage to roofs, siding, and trees. this severe thunderstorm will remain over mainly rural areas of east central todd and northwestern morrison counties, including the following locations: philbrook, cushing and crow wing state park. this includes u. s. Highway 10 in minnesota between mile markers 114 and 137. 9/22/2017 4:25 AM CDT At 424 am cdt, a severe thunderstorm was located 7 miles south of staples, or 27 miles northwest of little falls, moving northeast at 40 mph (radar indicated). Hazards include 60 mph wind gusts and quarter size hail. Hail damage to vehicles is expected. Expect wind damage to roofs, siding, and trees. 9/22/2017 4:14 AM CDT At 414 am cdt, a severe thunderstorm was located near eagle bend, or 29 miles northeast of alexandria, moving northeast at 35 mph (radar indicated). Hazards include 60 mph wind gusts and quarter size hail. Hail damage to vehicles is expected. expect wind damage to roofs, siding, and trees. 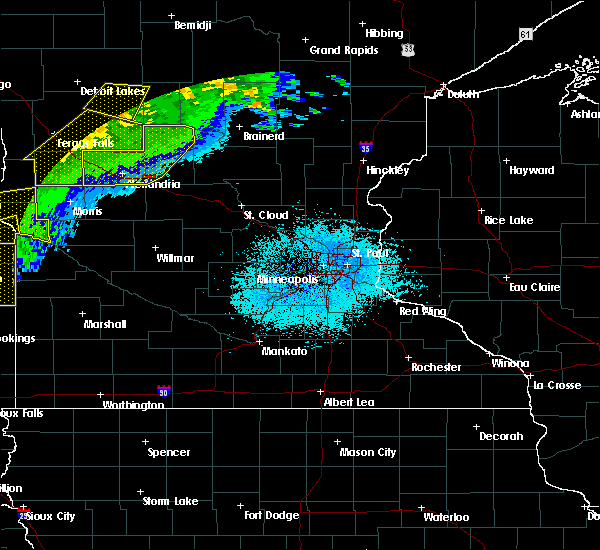 this severe thunderstorm will be near, staples around 435 am cdt. staples airport around 440 am cdt. other locations impacted by this severe thunderstorm include philbrook. this includes the following highways, u. s. highway 10 in minnesota between mile markers 103 and 114. u. s. Highway 71 between mile markers 196 and 197, and between mile markers 207 and 219. 9/20/2017 1:21 AM CDT At 119 am cdt, severe thunderstorms were located along a line extending from near staples airport, to fort ripley, to 10 miles southeast of pierz, moving northeast at 70 mph. these are very dangerous storms (radar indicated. 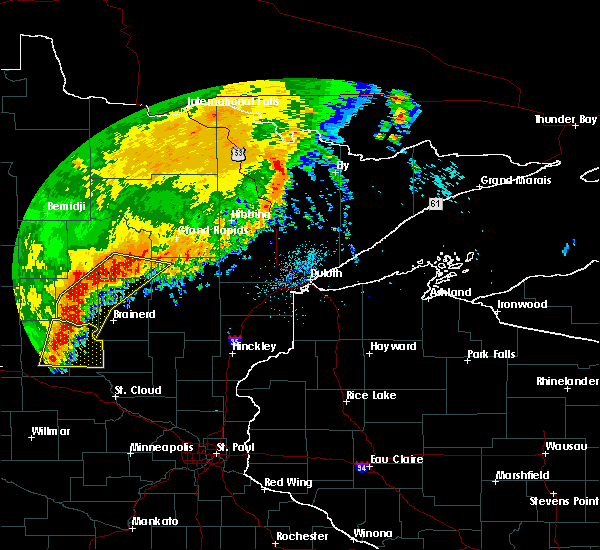 several reports of severe wind gusts from observation sites have also been reported with this line of storms). Hazards include 80 mph wind gusts and penny size hail. Flying debris will be dangerous to those caught without shelter. mobile homes will be heavily damaged. expect considerable damage to roofs, windows, and vehicles. Extensive tree damage and power outages are likely. 9/4/2017 1:29 PM CDT At 128 pm cdt, a severe thunderstorm was located near gull lake, or 14 miles northwest of brainerd, moving southeast at 40 mph (radar indicated). Hazards include 60 mph wind gusts and half dollar size hail. Hail damage to vehicles is expected. expect wind damage to roofs, siding, and trees. 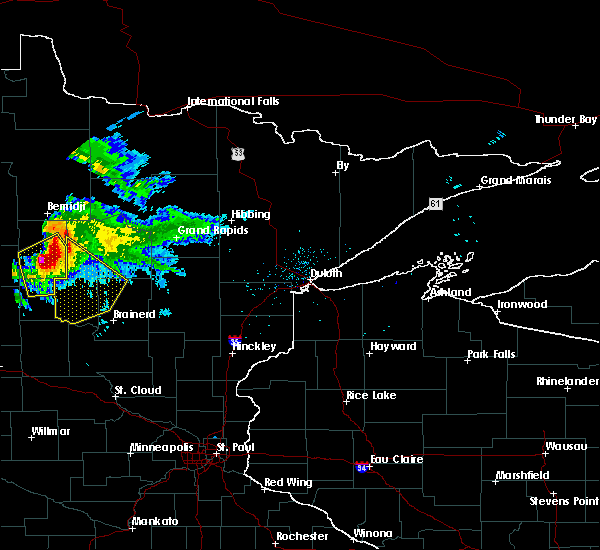 this severe storm will be near, pillager around 140 pm cdt. brainerd, baxter and saint mathias around 145 pm cdt. other locations impacted by this severe thunderstorm include lake shore, barrows, lennox, sylvan, casino, north long lake, st. Mathias, crow wing state park, and east gull lake. 9/4/2017 1:07 PM CDT At 106 pm cdt, a severe thunderstorm was located near poplar, or 27 miles northwest of brainerd, moving southeast at 40 mph (radar indicated). Hazards include 60 mph wind gusts and half dollar size hail. Hail damage to vehicles is expected. expect wind damage to roofs, siding, and trees. 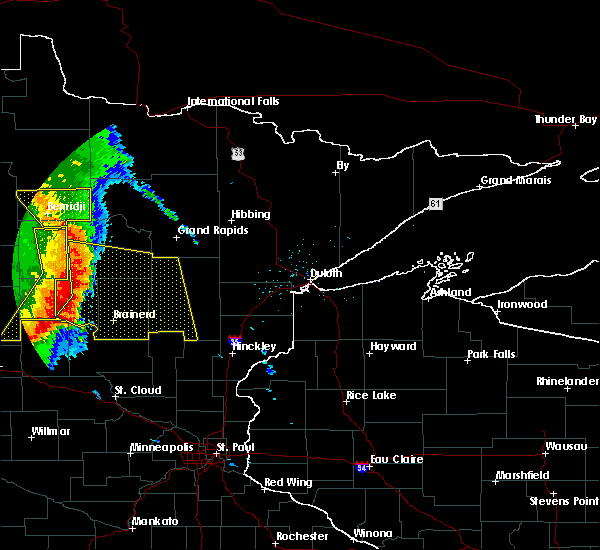 this severe thunderstorm will be near, leader around 115 pm cdt. gull lake around 130 pm cdt. pillager around 140 pm cdt. baxter and saint mathias around 145 pm cdt. other locations impacted by this severe thunderstorm include lake shore, barrows, lennox, sylvan, casino, north long lake, st. Mathias, crow wing state park, and east gull lake. 7/17/2017 5:29 PM CDT At 529 pm cdt, a severe thunderstorm was located over clarissa, or 26 miles northeast of alexandria, moving east at 20 mph (radar indicated). Hazards include golf ball size hail and 60 mph wind gusts. People and animals outdoors will be injured. expect hail damage to roofs, siding, windows, and vehicles. expect wind damage to roofs, siding, and trees. this severe thunderstorm will be near, browerville around 540 pm cdt. 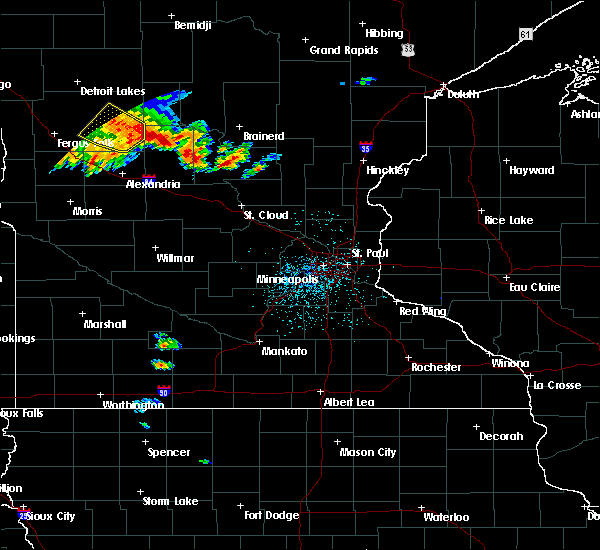 randall and fort ripley around 630 pm cdt. 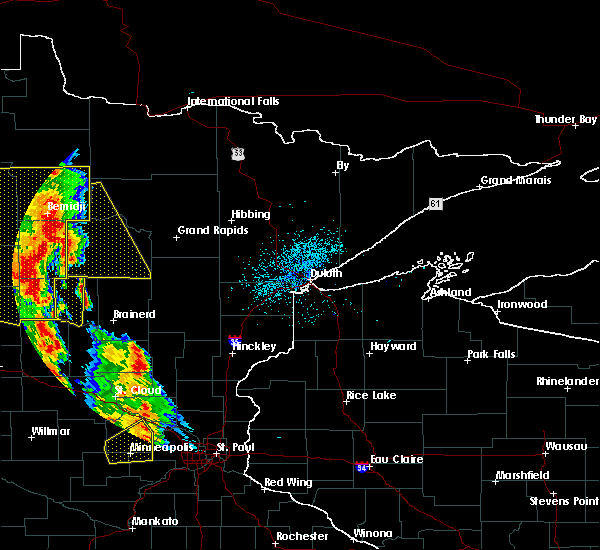 Other locations impacted by this severe thunderstorm include philbrook, cushing, clotho and crow wing state park. 8/4/2016 3:01 AM CDT At 300 am cdt, severe thunderstorms were located along a line extending from near sylvan to near flensburg, moving east at 45 mph (radar indicated). Hazards include 60 mph wind gusts and nickel size hail. Expect damage to roofs. siding. and trees. 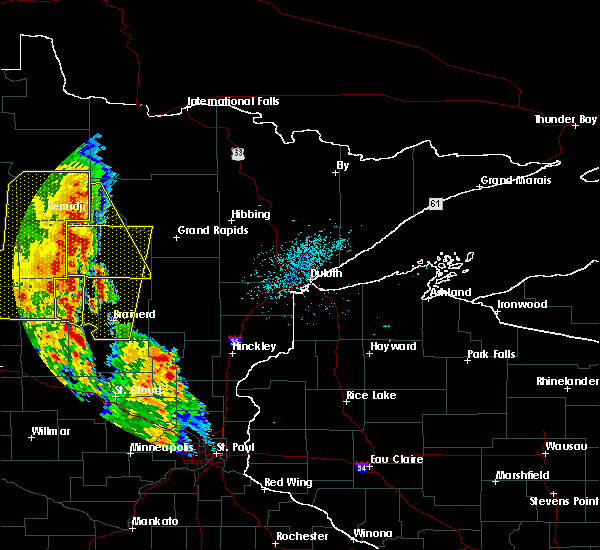 these severe storms will be near, crow wing state park around 305 am cdt. little falls around 310 am cdt. Other locations impacted by these severe thunderstorms include sobieski, cushing, little falls airport and camp ripley junction. 8/4/2016 2:50 AM CDT At 249 am cdt, severe thunderstorms were located along a line extending from 7 miles east of wabedo, to 6 miles northeast of leader, to near browerville, moving southeast at 25 mph (radar indicated). Hazards include 70 mph wind gusts and quarter size hail. Hail damage to vehicles is expected. expect considerable tree damage. wind damage is also likely to mobile homes, roofs, and outbuildings. Locations impacted include, baxter, breezy point, pequot lakes, crosslake, nisswa, pine river, emily, hill city, pillager, fifty lakes, gull lake, swatara, leader, outing, sylvan, east gull lake, lake shore, jenkins, thunder lake and chickamaw beach. 8/4/2016 2:40 AM CDT At 240 am cdt, severe thunderstorms were located along a line extending from near motley to near long prairie, moving east at 45 mph (radar indicated). Hazards include 60 mph wind gusts and nickel size hail. Expect damage to roofs. siding. and trees. 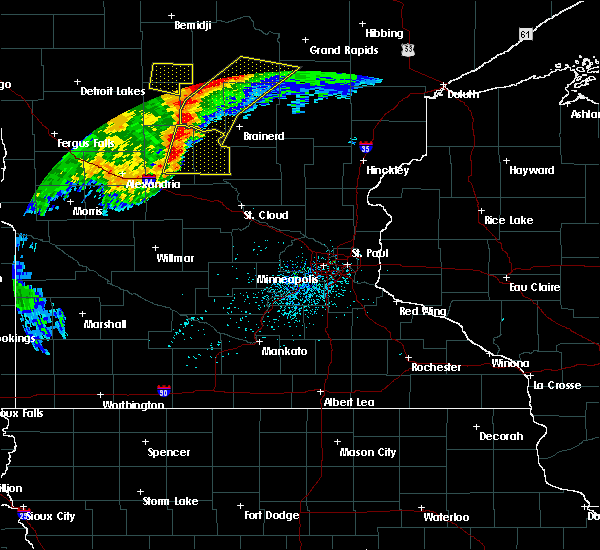 severe thunderstorms will be near, motley around 245 am cdt. swanville around 250 am cdt. flensburg around 255 am cdt. randall around 300 am cdt. 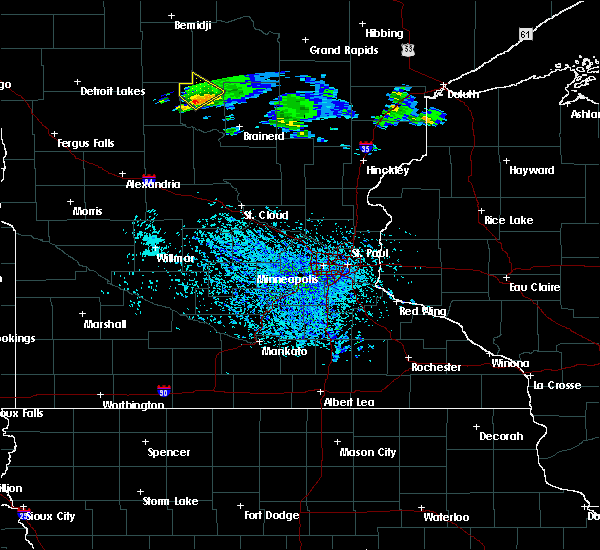 little falls and crow wing state park around 305 am cdt. other locations impacted by these severe thunderstorms include cushing, little falls airport, round prairie, long prairie airport, sobieski, philbrook and camp ripley junction. this includes the following highways, u. s. highway 10 in minnesota between mile markers 107 and 153. u. s. Highway 71 between mile markers 181 and 196. 8/4/2016 2:37 AM CDT At 234 am cdt, severe thunderstorms were located along a line extending from near longville, to near poplar, to near browerville, moving southeast at 25 mph (radar indicated. 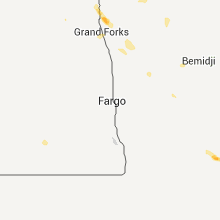 at 210 am a roof was blown off a building near menagha in wadena county). Hazards include 70 mph wind gusts and quarter size hail. Hail damage to vehicles is expected. expect considerable tree damage. Wind damage is also likely to mobile homes, roofs, and outbuildings. 7/21/2016 2:27 AM CDT The severe thunderstorm warning for todd, douglas and northwestern morrison counties will expire at 230 am cdt, the storms which prompted the warning have weakened below severe limits, and no longer pose an immediate threat to life or property. therefore the warning will be allowed to expire. however gusty winds are still possible with these thunderstorms. 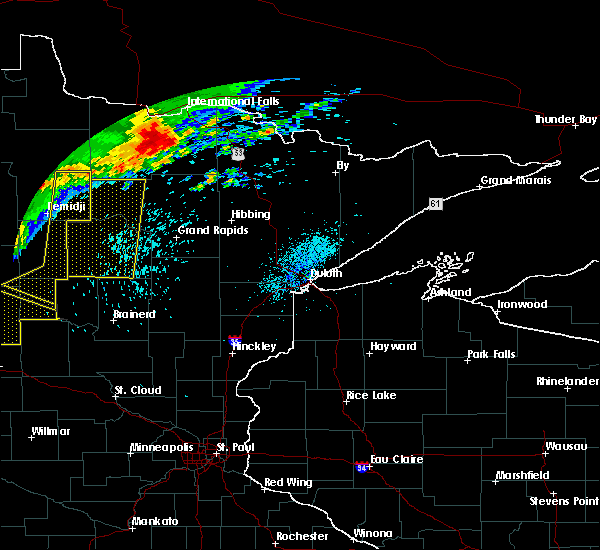 a severe thunderstorm watch remains in effect until 700 am cdt for central minnesota. 7/21/2016 2:06 AM CDT At 206 am cdt, severe thunderstorms were located along a line extending from near emily, to near lastrup, moving east at 55 mph (trained weather spotters). Hazards include 70 mph wind gusts and quarter size hail. Hail damage to vehicles is expected. expect considerable tree damage. wind damage is also likely to mobile homes, roofs, and outbuildings. These severe thunderstorms will remain over mainly rural areas of southern cass, southern aitkin and crow wing counties, including the following locations: glen, pine center, east gull lake, edward lake, wealthwood, gun lake, lennox, chickamaw beach, mission and swanburg. 7/21/2016 1:51 AM CDT At 151 am cdt, severe thunderstorms were located along a line extending from near motley to near rose city to near campbell, moving southeast at 50 mph (radar indicated). Hazards include 60 mph wind gusts. Expect damage to roofs. siding. and trees. severe thunderstorms will be near, motley and eagle bend around 155 am cdt. clarissa around 200 am cdt. crow wing state park and long prairie around 210 am cdt. randall around 215 am cdt. camp ripley around 220 am cdt. other locations impacted by these severe thunderstorms include garfield, round prairie, nelson, clotho, alexandria airport, rose city, leaf valley, melby, miltona and holmes city. this includes the following highways, interstate 94 in minnesota between mile markers 81 and 117. u. s. highway 10 in minnesota between mile markers 104 and 138. u. s. Highway 71 between mile markers 181 and 219. 7/21/2016 1:46 AM CDT At 145 am cdt, severe thunderstorms were located along a line extending from 7 miles west of fifty lakes, to near pillager, moving east at 50 mph (emergency management). Hazards include 70 mph wind gusts and quarter size hail. Hail damage to vehicles is expected. expect considerable tree damage. wind damage is also likely to mobile homes, roofs, and outbuildings. 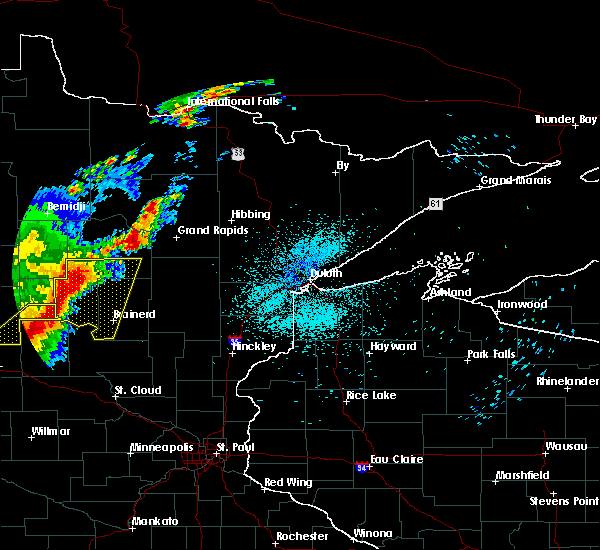 these severe storms will be near, breezy point, crosslake and fifty lakes around 150 am cdt. 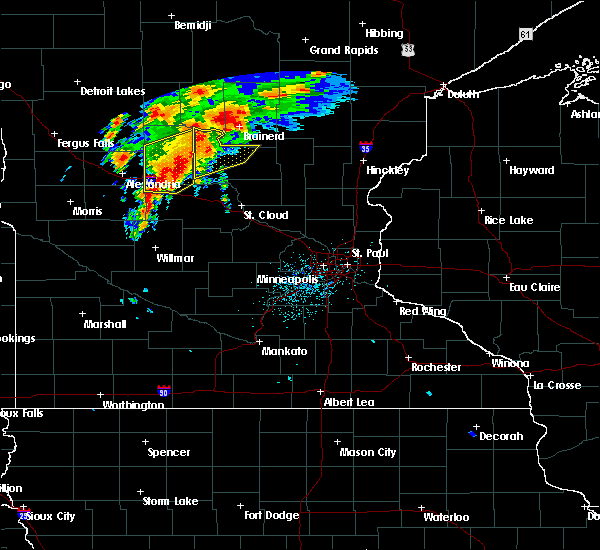 saint mathias around 155 am cdt. 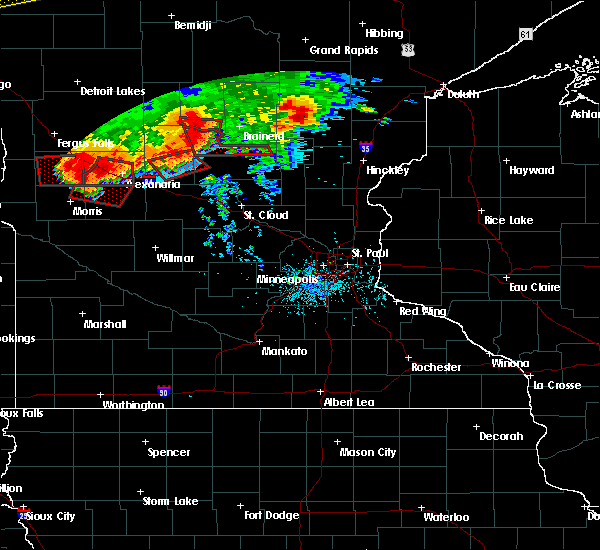 brainerd and emily around 200 am cdt. south long lake and upper south long lake around 205 am cdt. garrison around 215 am cdt. Other locations impacted by these severe thunderstorms include glen, pine center, east gull lake, edward lake, wealthwood, gun lake, lennox, chickamaw beach, mission and swanburg. 7/21/2016 1:34 AM CDT At 132 am cdt, severe thunderstorms were located along a line extending from backus, to near motley, moving east at 80 mph (emergency management). Hazards include 70 mph wind gusts and quarter size hail. Hail damage to vehicles is expected. expect considerable tree damage. wind damage is also likely to mobile homes, roofs, and outbuildings. 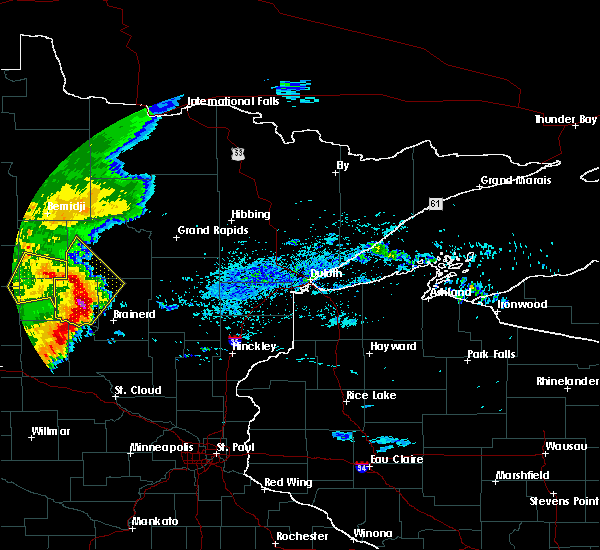 severe thunderstorms will be near, baxter, breezy point, crosslake, fifty lakes, fort ripley and brainerd around 145 am cdt. emily and saint mathias around 150 am cdt. garrison around 205 am cdt. palisade around 210 am cdt. big sandy lake, mcgregor and libby around 215 am cdt. Other locations impacted by these severe thunderstorms include glen, pine center, east gull lake, edward lake, wealthwood, gun lake, lennox, chickamaw beach, mission and swanburg. 7/11/2016 3:28 AM CDT At 325 am cdt, severe thunderstorms were located along a line extending from 7 miles southwest of boy river to near breezy point to pillager, moving east at 45 mph. these are very dangerous storms (radar indicated). Hazards include 80 mph wind gusts and quarter size hail. Flying debris will be dangerous to those caught without shelter. mobile homes will be heavily damaged. expect considerable damage to roofs, windows, and vehicles. extensive tree damage and power outages are likely. 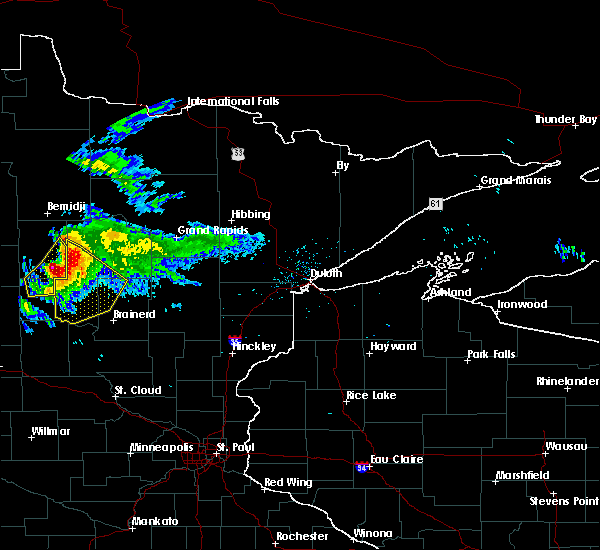 these severe storms will be near, crosslake and longville around 330 am cdt. brainerd and crosby around 345 am cdt. 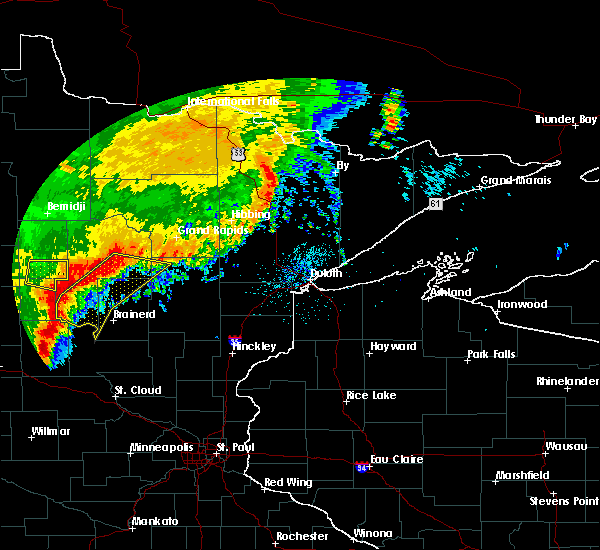 remer and cuyuna around 350 am cdt. 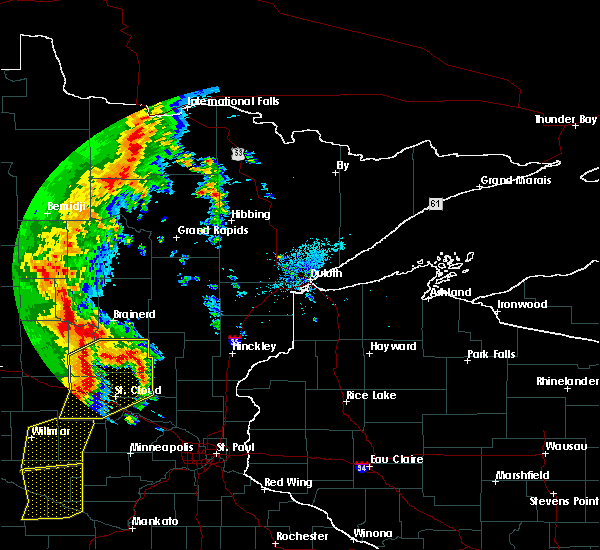 aitkin and garrison around 400 am cdt. Other locations impacted by these severe thunderstorms include glen, fifty lakes, pine center, east gull lake, edward lake, wealthwood, washburn lake, lennox, chickamaw beach and mission. 7/11/2016 3:12 AM CDT At 311 am cdt, severe thunderstorms were located along a line extending from near walker to near pine river to 7 miles southwest of motley, moving southeast at 55 mph. these are very dangerous storms (radar indicated). Hazards include 80 mph wind gusts and quarter size hail. Flying debris will be dangerous to those caught without shelter. mobile homes will be heavily damaged. expect considerable damage to roofs, windows, and vehicles. extensive tree damage and power outages are likely. 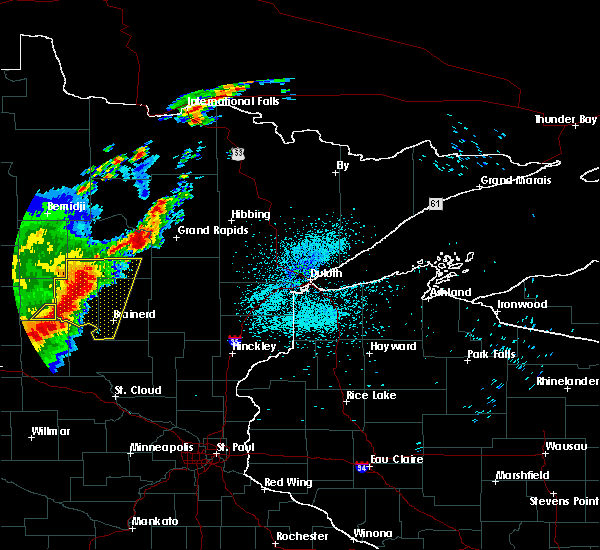 these severe storms will be near, pine river around 315 am cdt. breezy point, pequot lakes, nisswa and gull lake around 320 am cdt. 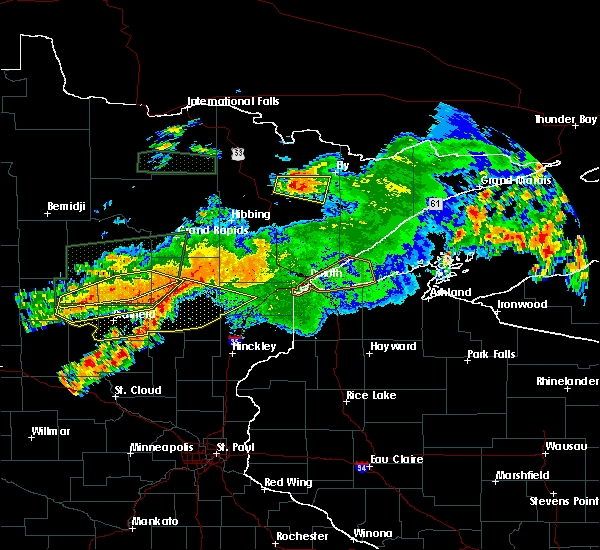 wabedo, longville, fort ripley and merrifield around 330 am cdt. ironton around 335 am cdt. 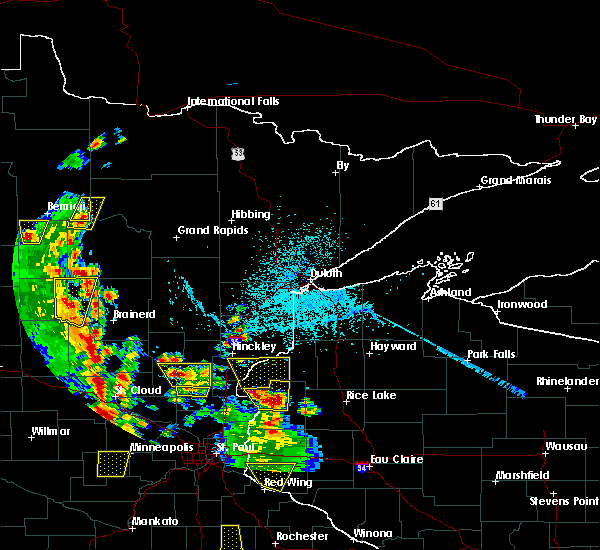 crosby, deerwood, remer and cuyuna around 340 am cdt. emily and outing around 345 am cdt. garrison around 350 am cdt. Other locations impacted by these severe thunderstorms include glen, pine center, east gull lake, wealthwood, washburn lake, lennox, chickamaw beach and mission. 7/11/2016 2:57 AM CDT At 254 am cdt, severe thunderstorms were located along a line extending from near laporte to 6 miles east of poplar to 6 miles northeast of clarissa, moving southeast at 85 mph. these are very dangerous storms (radar indicated). Hazards include 80 mph wind gusts and quarter size hail. Flying debris will be dangerous to those caught without shelter. mobile homes will be heavily damaged. expect considerable damage to roofs, windows, and vehicles. extensive tree damage and power outages are likely. 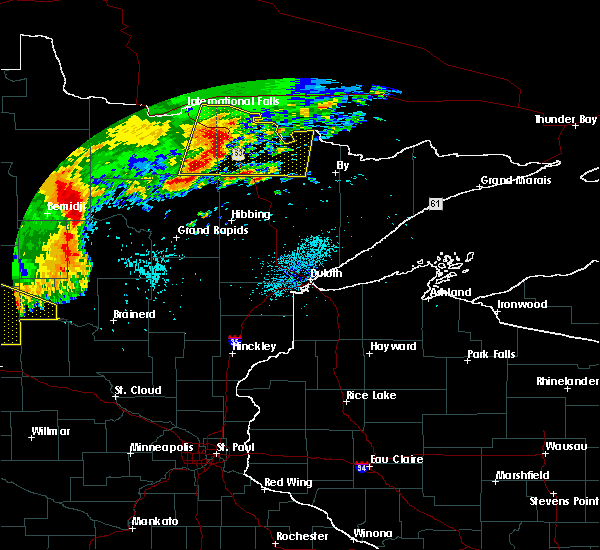 severe thunderstorms will be near, breezy point, pequot lakes, nisswa and gull lake around 305 am cdt. brainerd, baxter, longville, fort ripley and merrifield around 310 am cdt. 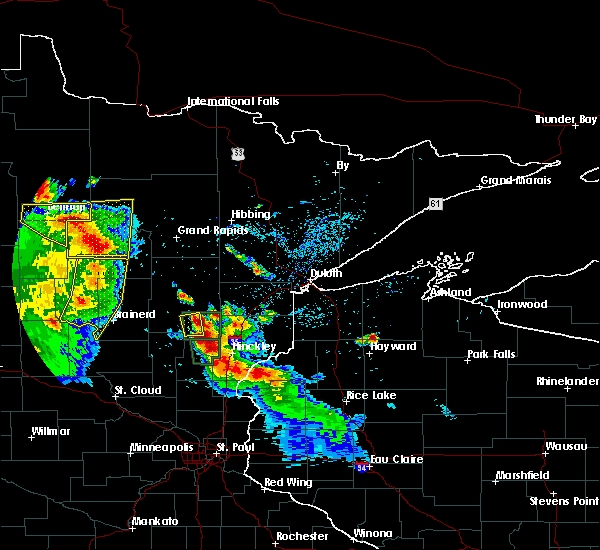 crosby, ironton, deerwood, cuyuna at 315 am cdt. remer around 320 am cdt. emily, garrison and outing around 325 am cdt. 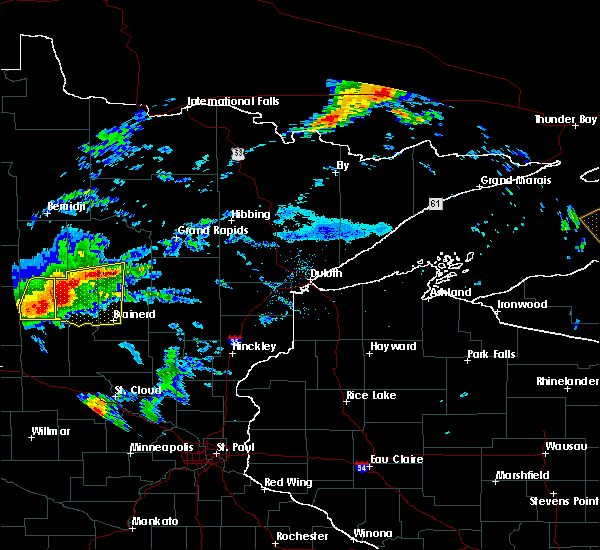 mille lacs lake, hill city, malmo and swatara around 330 am cdt. palisade around 340 am cdt. 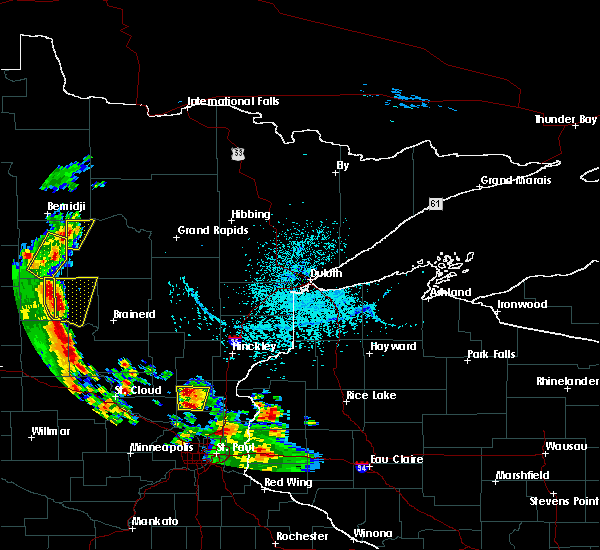 other locations impacted by these severe thunderstorms include glen, pine center, east gull lake. Chickamaw beach and mission. 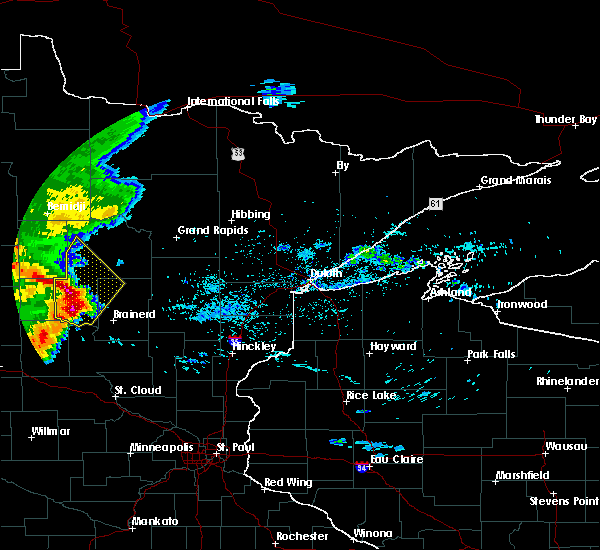 6/25/2016 3:24 PM CDT At 324 pm cdt, a severe thunderstorm was located near philbrook, or 24 miles west of crow wing state park, moving northeast at 30 mph (radar indicated). Hazards include 60 mph wind gusts. Expect damage to roofs. siding. and trees. this severe storm will be near, staples and staples airport around 335 pm cdt. motley around 345 pm cdt. other locations impacted by this severe thunderstorm include philbrook. 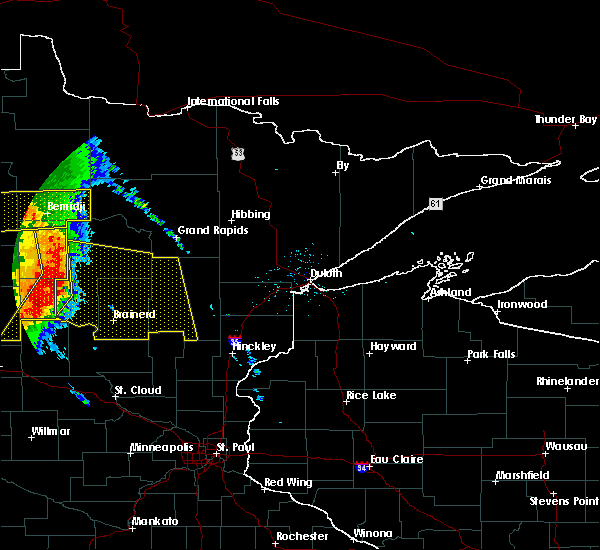 A tornado watch remains in effect until 900 pm cdt for central minnesota. 6/25/2016 3:14 PM CDT At 314 pm cdt, a severe thunderstorm was located near clarissa, or 28 miles west of crow wing state park, moving northeast at 25 mph (radar indicated). Hazards include 60 mph wind gusts and quarter size hail. Hail damage to vehicles is expected. expect wind damage to roofs, siding, and trees. this severe thunderstorm will be near, staples and staples airport around 340 pm cdt. motley around 350 pm cdt. other locations impacted by this severe thunderstorm include philbrook. this includes u. s. highway 10 in minnesota between mile markers 106 and 122. 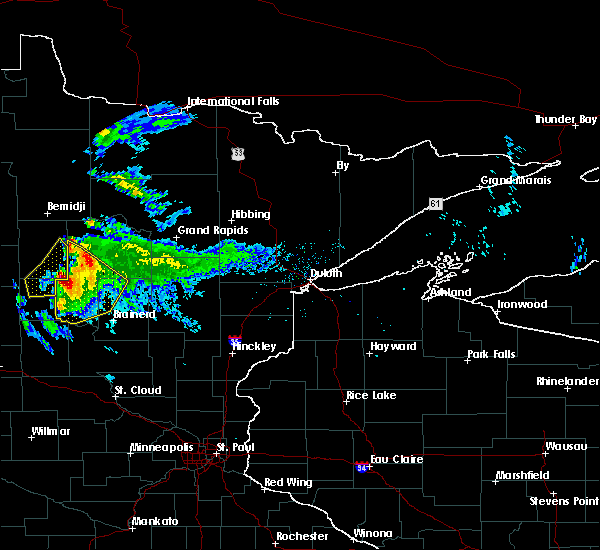 A tornado watch remains in effect until 900 pm cdt for central minnesota. 6/19/2016 6:33 PM CDT At 632 pm cdt, a severe thunderstorm capable of producing a tornado was located near gull lake, or 14 miles northwest of brainerd, moving east at 45 mph (weather spotters reported a funnel cloud near gull lake). Hazards include tornado and tennis ball size hail. Flying debris will be dangerous to those caught without shelter. mobile homes will be damaged or destroyed. damage to roofs, windows, and vehicles will occur. tree damage is likely. 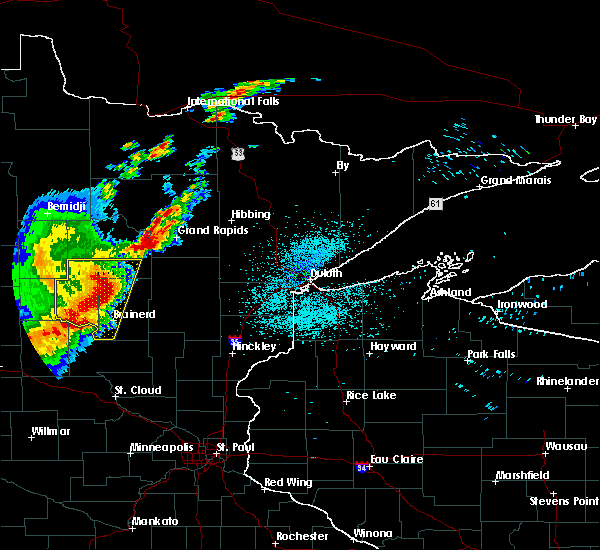 this dangerous storm will be near, gull lake around 635 pm cdt. baxter and brainerd around 640 pm cdt. 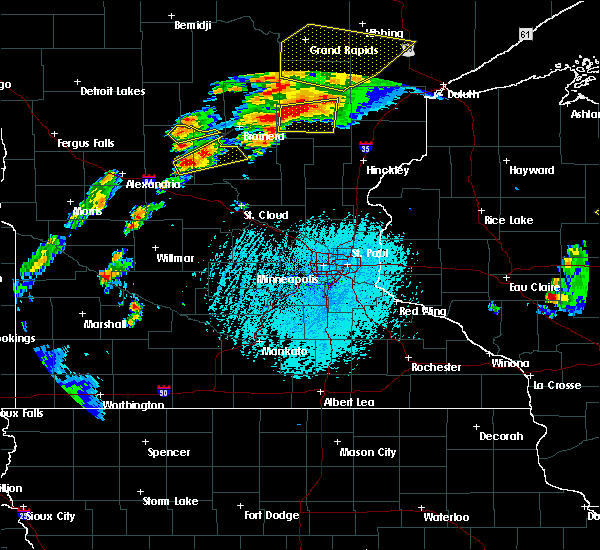 pequot lakes, nisswa and merrifield around 645 pm cdt. breezy point around 650 pm cdt. Other locations impacted by this tornadic thunderstorm include east gull lake, edward lake, crow wing state park, sylvan, casino, lake shore, barrows, north long lake, lower whitefish lake and lower hay lake. 6/19/2016 6:21 PM CDT At 620 pm cdt, a severe thunderstorm capable of producing a tornado was located near leader, or 20 miles northwest of brainerd, moving east at 50 mph (radar indicated rotation). Hazards include tornado and tennis ball size hail. Flying debris will be dangerous to those caught without shelter. mobile homes will be damaged or destroyed. damage to roofs, windows, and vehicles will occur. tree damage is likely. this dangerous storm will be near, gull lake around 635 pm cdt. 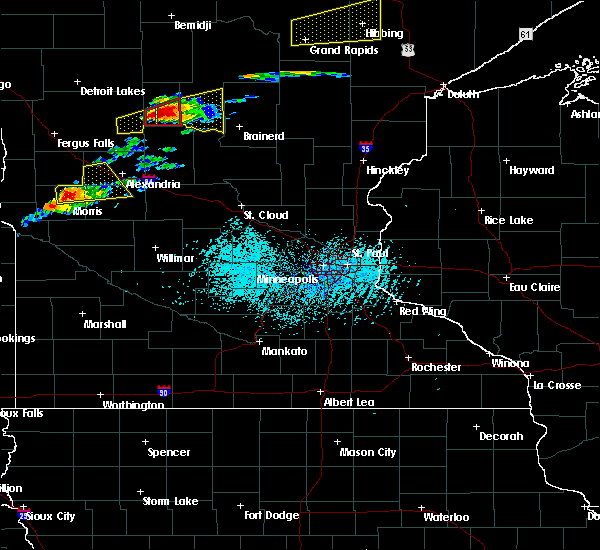 brainerd, baxter, pequot lakes and nisswa around 640 pm cdt. breezy point and merrifield around 645 pm cdt. Other locations impacted by this tornadic thunderstorm include east gull lake, edward lake, crow wing state park, sylvan, casino, lake shore, barrows, esterdy, north long lake and lower whitefish lake. 6/19/2016 6:10 PM CDT At 610 pm cdt, a severe thunderstorm capable of producing a tornado was located near staples airport, or 28 miles west of brainerd, moving east at 50 mph (radar indicated rotation). Hazards include tornado and tennis ball size hail. Flying debris will be dangerous to those caught without shelter. mobile homes will be damaged or destroyed. damage to roofs, windows, and vehicles will occur. tree damage is likely. this dangerous storm will be near, poplar around 615 pm cdt. leader around 620 pm cdt. gull lake around 635 pm cdt. baxter, pequot lakes and nisswa around 640 pm cdt. brainerd, breezy point and merrifield around 645 pm cdt. Other locations impacted by this tornadic thunderstorm include east gull lake, edward lake, crow wing state park, sylvan, casino, lake shore, barrows, esterdy, north long lake and lower whitefish lake. 6/19/2016 5:56 PM CDT At 556 pm cdt, a severe thunderstorm was located near verndale, or 39 miles west of brainerd, moving east at 50 mph (radar indicated). Hazards include ping pong ball size hail and 60 mph wind gusts. People and animals outdoors will be injured. expect hail damage to roofs, siding, windows, and vehicles. expect wind damage to roofs, siding, and trees. this severe thunderstorm will be near, poplar around 615 pm cdt. leader around 620 pm cdt. gull lake around 635 pm cdt. Other locations impacted by this severe thunderstorm include sylvan, casino, esterdy, east gull lake, lake shore and chickamaw beach. 6/17/2016 11:13 AM CDT The national weather service in the twin cities has issued a * severe thunderstorm warning for. northern todd county in central minnesota. until noon cdt * at 1113 am cdt. a severe thunderstorm was located near eagle bend. or 28 miles northeast of alexandria. Moving east at 30 mph. 8/16/2015 1:18 AM CDT At 117 am cdt, severe thunderstorms were located along a line extending from near wabedo to near pillager, moving east at 35 mph (radar indicated). Hazards include 60 mph wind gusts and half dollar size hail. Hail damage to vehicles is expected. expect wind damage to roofs, siding and trees. 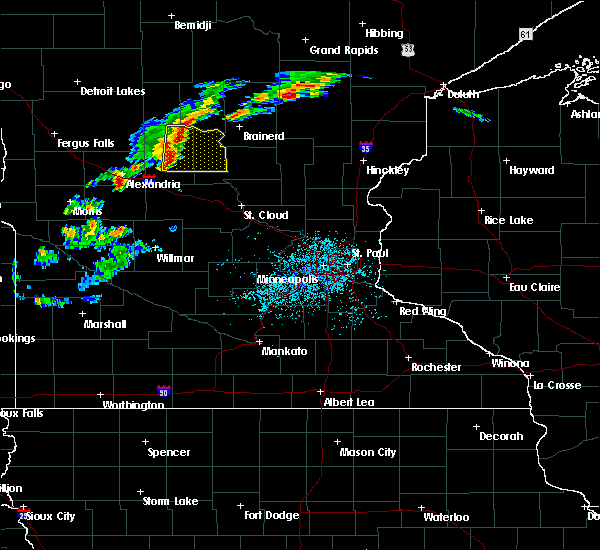 these severe storms will be near, wabedo around 125 am cdt. brainerd, emily and outing around 130 am cdt. Other locations impacted by these severe thunderstorms include east gull lake, edward lake, pheasant lake, thunder lake, washburn lake, lennox, lake roosevelt, chickamaw beach, mission and swanburg. 8/16/2015 1:03 AM CDT At 102 am cdt, severe thunderstorms were located along a line extending from 6 miles southwest of woman lake to near motley, moving east at 30 mph (radar indicated). Hazards include 60 mph wind gusts and half dollar size hail. Hail damage to vehicles is expected. expect wind damage to roofs, siding and trees. 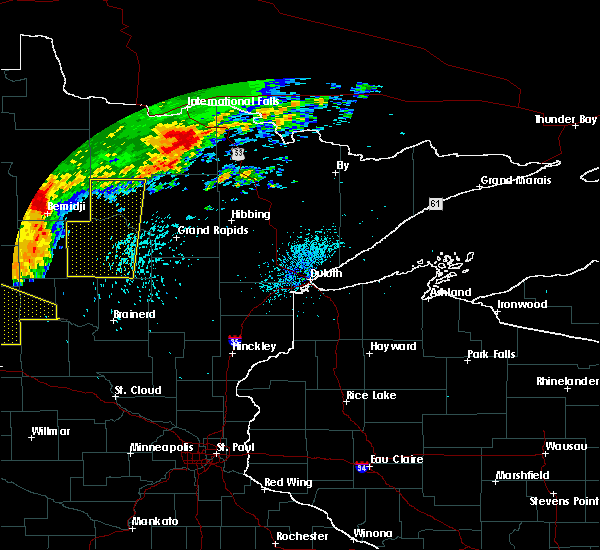 these severe storms will be near, woman lake around 110 am cdt. longville around 115 am cdt. crosslake and wabedo around 120 am cdt. fifty lakes around 125 am cdt. crow wing state park, baxter, emily, fort ripley, saint mathias and outing around 130 am cdt. Other locations impacted by these severe thunderstorms include east gull lake, edward lake, pheasant lake, thunder lake, washburn lake, lennox, lake roosevelt, chickamaw beach, mission and swanburg. 8/16/2015 12:50 AM CDT At 1249 am cdt, severe thunderstorms were located along a line extending from near hackensack to near staples, moving east at 30 mph (radar indicated). Hazards include 60 mph wind gusts and half dollar size hail. Hail damage to vehicles is expected. expect wind damage to roofs, siding and trees. severe thunderstorms will be near, hackensack and backus around 1255 am cdt. woman lake around 110 am cdt. pillager, wabedo and longville around 115 am cdt. crosslake around 120 am cdt. fifty lakes around 125 am cdt. crow wing state park, baxter, emily, fort ripley, saint mathias and outing around 130 am cdt. Other locations impacted by these severe thunderstorms include east gull lake, edward lake, pheasant lake, thunder lake, washburn lake, lennox, lake roosevelt, chickamaw beach, mission and swanburg. 8/13/2015 1:20 AM CDT At 120 am cdt, severe thunderstorms were located along a line extending from near pillager to 7 miles northeast of browerville to near parkers prairie, moving southeast at 45 mph (radar indicated). Hazards include 60 mph wind gusts and quarter size hail. Hail damage to vehicles is expected. expect wind damage to roofs, siding and trees. 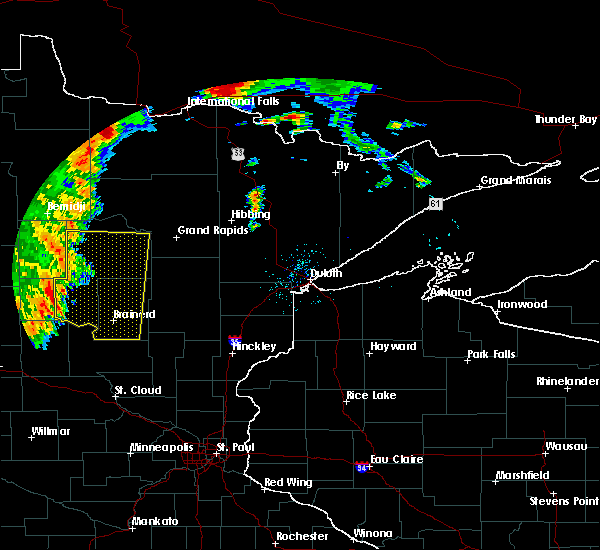 severe thunderstorms will be near, browerville around 125 am cdt. randall and camp ripley around 140 am cdt. 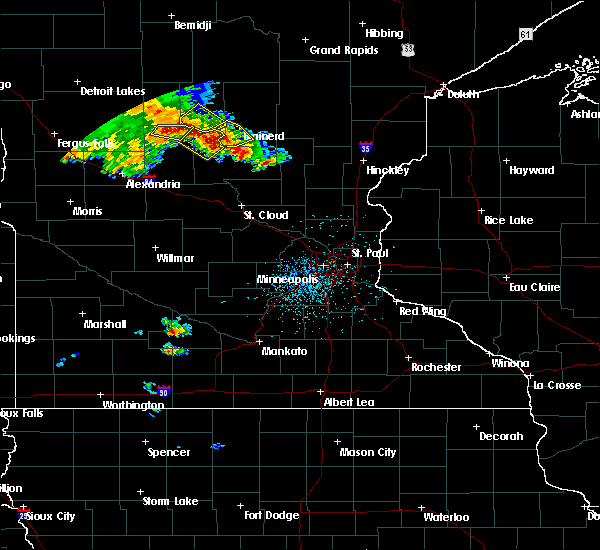 little falls, swanville and flensburg around 150 am cdt. other locations impacted by these severe thunderstorms include burtrum, little sauk, little falls airport, cushing, round prairie, long prairie airport, clotho, sobieski, rose city and philbrook. this includes the following highways, u. s. highway 10 in minnesota between mile markers 115 and 148. u. s. Highway 71 between mile markers 178 and 214. 8/12/2015 7:19 PM CDT At 718 pm cdt, severe thunderstorms were located along a line extending from near hackensack to near backus to 8 miles north of poplar, moving southeast at 50 mph. these are very dangerous storms (radar indicated). Hazards include baseball size hail and 70 mph wind gusts. People and animals outdoors will be severely injured. expect shattered windows, extensive damage to roofs, siding and vehicles. Locations impacted include, walker, breezy point, pequot lakes, crosslake, nisswa, pine river, emily, fifty lakes, hackensack, backus, poplar, gull lake, woman lake, leader, leech lake, east gull lake, lake shore, oshawa, jenkins and ten mile lake. 8/12/2015 7:04 PM CDT At 703 pm cdt, severe thunderstorms were located along a line extending from near walker to 6 miles west of hackensack to near huntersville, moving southeast at 50 mph. these are very dangerous storms (radar indicated. at half dollar sized hail was reported in nevis). Hazards include baseball size hail and 70 mph wind gusts. People and animals outdoors will be severely injured. expect shattered windows, extensive damage to roofs, siding and vehicles. these severe storms will be near, hackensack and backus around 715 pm cdt. woman lake around 720 pm cdt. pine river and poplar around 725 pm cdt. breezy point, pequot lakes, crosslake and leader around 730 pm cdt. Other locations impacted by these severe thunderstorms include pontoria, whipholt, east gull lake, pheasant lake, casino, chickamaw beach, lake shore, webb lake, manhattan beach and swanburg. 8/12/2015 6:45 PM CDT At 644 pm cdt, severe thunderstorms were located along a line extending from near laporte to nevis to near park rapids, moving southeast at 50 mph. these are very dangerous storms (radar indicated). Hazards include baseball size hail and 70 mph wind gusts. People and animals outdoors will be severely injured. expect shattered windows, extensive damage to roofs, siding and vehicles. 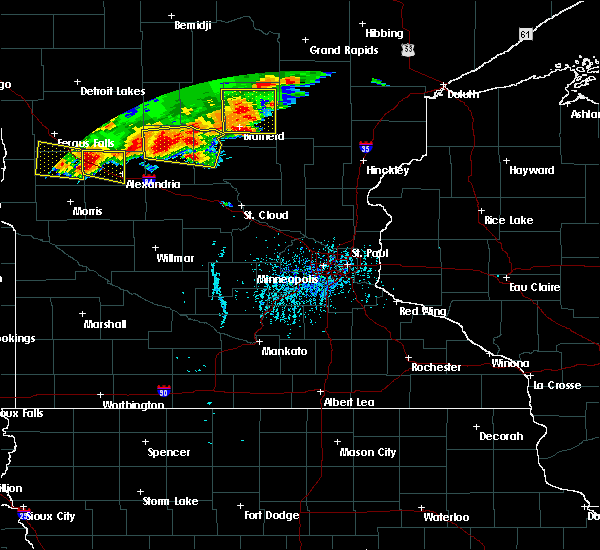 severe thunderstorms will be near, walker around 655 pm cdt. backus around 705 pm cdt. hackensack around 710 pm cdt. woman lake around 715 pm cdt. pine river and poplar around 720 pm cdt. leader around 725 pm cdt. breezy point, pequot lakes, crosslake, nisswa, fifty lakes and gull lake around 730 pm cdt. Other locations impacted by these severe thunderstorms include pontoria, whipholt, east gull lake, pheasant lake, casino, chickamaw beach, lake shore, webb lake, manhattan beach and swanburg. 7/24/2015 2:35 AM CDT At 234 am cdt, severe thunderstorms were located along a line extending from near federal dam to near pillager, moving east at 40 mph (radar indicated). Hazards include 60 mph wind gusts and penny size hail. Expect damage to roofs. siding and trees. 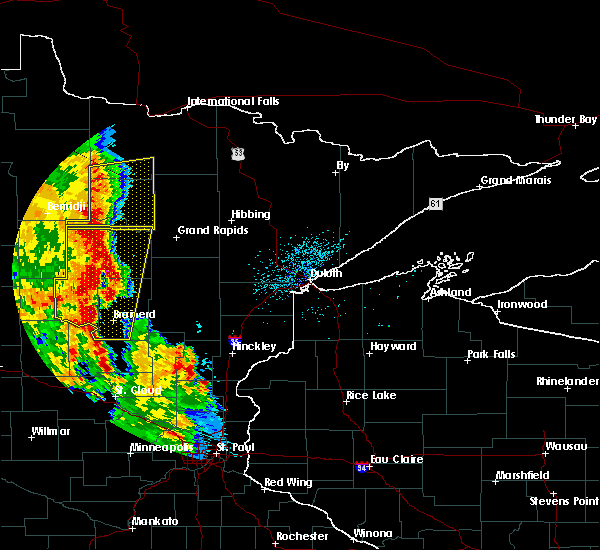 these severe storms will be near, crow wing state park and federal dam around 240 am cdt. 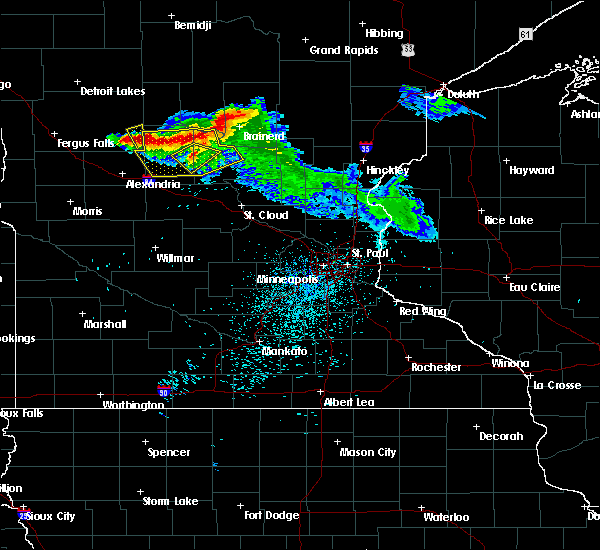 brainerd and boy river around 245 am cdt. other locations impacted by these severe thunderstorms include east gull lake, edward lake, washburn lake, lennox, chickamaw beach, mission, swanburg, esterdy, lower mission lake and mud lake. This includes northern lights casino and white oak casino. 7/24/2015 2:21 AM CDT At 221 am cdt, severe thunderstorms were located along a line extending from near leech lake to near pillager, moving east at 40 mph (radar indicated). Hazards include 60 mph wind gusts and penny size hail. Expect damage to roofs. siding and trees. 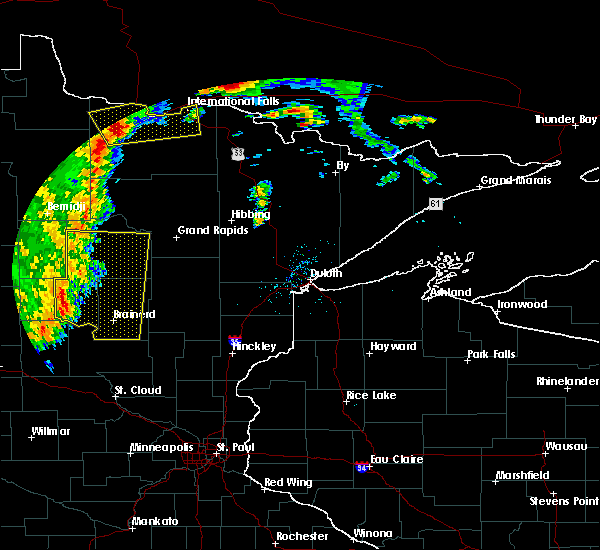 severe thunderstorms will be near, federal dam around 230 am cdt. crow wing state park and leech lake around 235 am cdt. 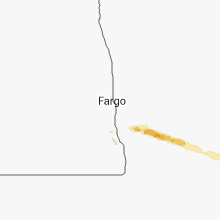 baxter and boy river around 240 am cdt. brainerd and south long lake around 245 am cdt. other locations impacted by these severe thunderstorms include east gull lake, edward lake, washburn lake, lennox, chickamaw beach, mission, swanburg, esterdy, lower mission lake and mud lake. This includes northern lights casino and white oak casino. 7/24/2015 2:15 AM CDT At 215 am cdt, severe thunderstorms were located along a line extending from 7 miles northeast of huntersville to near leader, moving east at 40 mph (radar indicated). Hazards include 60 mph wind gusts and penny size hail. Expect damage to roofs. siding and trees. Locations impacted include, backus, poplar, leader, oshawa, casino and esterdy. 7/24/2015 1:59 AM CDT At 158 am cdt, severe thunderstorms were located along a line extending from near huntersville to 6 miles north of verndale, moving east at 40 mph (radar indicated). Hazards include 70 mph wind gusts and nickel size hail. Expect considerable tree damage. damage is likely to mobile homes, roofs and outbuildings. severe thunderstorms will be near, poplar and leader around 225 am cdt. backus around 230 am cdt. Other locations impacted by these severe thunderstorms include casino, oshawa and esterdy. 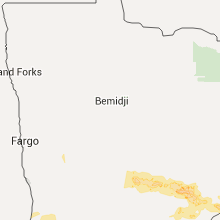 7/12/2015 7:21 PM CDT At 719 pm cdt, a severe thunderstorm capable of producing a tornado was located northeast of motley, or 18 miles west of brainerd, moving east at 35 mph (radar indicated rotation. at 715 pm...roof damage on a garage was reported 3 miles nw of motley). Hazards include tornado and golf ball size hail. Flying debris will be dangerous to those caught without shelter. mobile homes will be damaged or destroyed. damage to roofs, windows and vehicles will occur. tree damage is likely. Locations impacted include, pillager, gull lake, sylvan, east gull lake and casino. 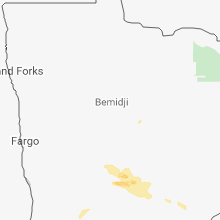 7/12/2015 7:10 PM CDT At 709 pm cdt, a severe thunderstorm capable of producing a tornado was located near motley, or 19 miles west of brainerd, moving east at 40 mph (radar indicated rotation). Hazards include tornado and golf ball size hail. Flying debris will be dangerous to those caught without shelter. mobile homes will be damaged or destroyed. damage to roofs, windows and vehicles will occur. tree damage is likely. Locations impacted include, pillager, gull lake, sylvan, east gull lake and casino. 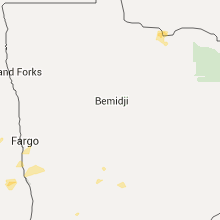 7/12/2015 7:00 PM CDT At 700 pm cdt, a severe thunderstorm capable of producing a tornado was located over motley, or 22 miles west of brainerd, moving east at 45 mph (radar indicated rotation). Hazards include tornado and half dollar size hail. Flying debris will be dangerous to those caught without shelter. mobile homes will be damaged or destroyed. damage to roofs, windows and vehicles will occur. tree damage is likely. This tornadic thunderstorm will remain over mainly rural areas of northern morrison and northeastern todd counties, including the following locations, cushing, philbrook, harding and camp ripley junction. 7/12/2015 6:57 PM CDT At 657 pm cdt, a severe thunderstorm capable of producing a tornado was located over staples, or 27 miles west of brainerd, moving east at 40 mph (radar indicated rotation). Hazards include tornado and golf ball size hail. Flying debris will be dangerous to those caught without shelter. mobile homes will be damaged or destroyed. damage to roofs, windows and vehicles will occur. Tree damage is likely.